Amboseli. Canon EOS 5DS R, EF100-400mm f/4.5-5.6L IS II USM lens. 1/1000s @ f5.6, ISO 100. Nevada. Canon EOS-1D X Mark II, EF24-70mm f/2.8L II USM lens. 1/1250s @ f4, ISO 200. Joshua Landscape: Finding a nice composition using a group of Joshua Tree’s actually proved to be a little more difficult than I anticipated. Finding separation between all the trees so that they could breathe within the image was the first task, then I needed to find a complimentary backdrop where they would pop and not be lost. Canon 5D Mk IV, 24-70mm f2.8 lens @ 35mm, 1/250s @ f/7.1, ISO 100. Canon EOS 5DS R, EF100-400mm f/4.5-5.6L IS II USM. 1/800s @ f5.6, ISO 100. Not all that long ago you would have been more likely to find photographer Richard Johnston wielding a blow torch or working a pipe bender rather than dealing with the intricacies of shutter speed and aperture. It took seven years working as a plumber and a unique series of events before the 30 year old from New South Wales realised his true calling lay in a world far away from pipes and fittings. Today he is a professional freelance photographer based on Sydney’s northern beaches and like many modern pros, Johnston’s business largely revolves around an eye-catching website that reflects his favourite subjects: surf, travel, aerial, wildlife, landscape, and more recently, wedding photography. Like many successful photographers, Richard Johnston became interested in the art at a young age while still at school. But it took time before he seriously looked at pursuing photography as a career. “Throughout high school I invested a lot of my time into film and, when given the option, studied photography as an elective,” he explains. Throughout his school years he would photograph his friends surfing at local reef breaks on the Central Coast. Surf photography is expensive, and his initial setup cost around $8000 paid for after three years packing shelves at his local Woolworths. But it was worth it. At just 16 years of age he jumped on a plane for Hawaii with the aim of filming Oahu’s famous big wave Pipeline from the water. By 2004, his footage had featured on Tension 7, a popular bodyboarding video series. “Back then I used to film bodyboarding and although I enjoyed it, unfortunately I couldn’t see too much of a financial future in it for myself,” he says. Following school, Johnston took six months off to work in the Canadian snowfields but when he returned home, like many young people starting out in the workforce, he was undecided on the direction to take. He eventually chose the security of learning a trade – something to fall back on if the need ever arose. Santa Cruz. Canon EOS-1D X Mark II, EF24-70mm f/2.8L II USM lens. 1/2000s @ f/2.8, ISO 100. After working as a plumber for several years the reality of long hours in a career Johnston wasn’t passionate about eventually started to weigh heavy. “Plumbing is a good trade but it’s not exactly something I was passionate about,” he says. In 2014 he was needing a break so decided to book a holiday to South East Asia with his partner. Prior to leaving he thought a “half decent” holiday demanded he take some reasonable photos. He bought a second-hand Canon 5D Mk II. The purchase was to prove a turning point. “After working for seven years as a plumber that trip coupled with the purchase of the camera reminded me what it was like to be behind the lens and I quickly came to realise what I had been missing,” he explains. A year and a half later Johnston suffered two serious back injuries at work that saw him bedridden, and it seemed fate was finally sending him a message. This image was shot on a surfing trip in the Mentawai Islands, Indonesia. I couldn’t believe just how good the water clarity was when we arrived and immediately wanted to take full advantage of it. To me, due to the wave and his body position, it looks as if he is entering another dimension. Canon EOS 1DX Mk II, 16-35mm f/2.8 lens @ 16mm, 1/1000s @ f/9, ISO 3200. In 2016 Johnston entered the Canon Light Awards and walked away with the winning photo in the Grand Final’s Full Frame category. He says the shot fortuitously came about because his partner had wanted to buy a photograph of some clouds to hang above the bed as a feature. The opportunity presented itself on the NSW Central Coast when wild storm activity had him racing down to nearby Wamberal beach where, in his words, he “set the tripod up, dialed the camera in with a slow shutter speed and began taking a sequence of images to capture the moment when the lighting would flash”. Ocean Storm. This is the image which won the Canon Light Award and set me on my current career path. Canon EOS 5D Mk II, 24-105mm f4 lens @ 67mm, 0.6s @ f/4, ISO 500. 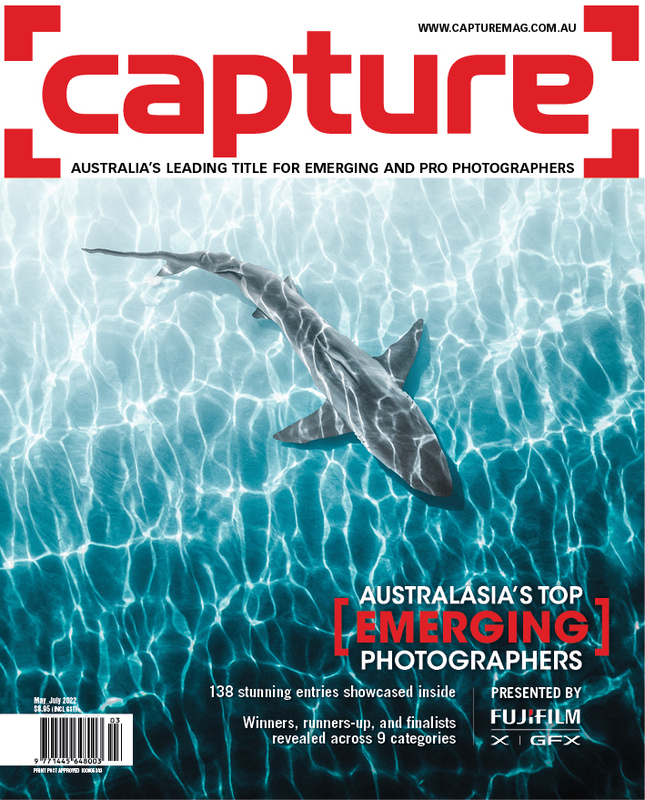 Johnston liked what his camera had captured, and obviously so did the judges of the Canon Light Awards – Georges Antoni, Mike Langford, Steven Dupont, Darren Jew and Sally Fitzgibbon. His winning image was awarded a trip to Africa where he made the most of the opportunity to photograph the country’s incredible wildlife and vast dry landscape. While Johnston’s award-winning image ‘Ocean Storm’ jump-started his photography career the resulting trip to Africa provided the ongoing charge. His primary focus since then has always been to produce and sell his work via his lonelyhunterphoto.com website. The business name came to Johnston while driving home one night with the newly framed Ocean Storm image on the back seat and The Foals song ‘Lonely Hunter’ playing on the car stereo. Johnston’s pro photography career had begun. Palm Springs. Canon EOS 5D Mark IV. EF16-35mm f/2.8L III USM lens. 1/640s @ f7.1, ISO 250. With a family history of photography and film which spans three generations, Johnston believes his love for cameras and photography is entwined in his DNA. Without being directly influenced by his father due to his early passing Johnston says the adage “the apple doesn’t fall far from the tree” rings true in his case. Having used wedding photography to supplement his income, Johnston recently discovered his grandfather also shot weddings while pursuing a film career. “My grandfather Roderick was involved with a lot of large projects but one which may be familiar to some are the old Paul Hogan Winfield ads that he directed. My dad Hugh was also involved with film and television…so it seems subconsciously I’ve followed a similar path to them. There’s a long family history of being around cameras,” he explains. Perhaps an indication of the variety of photographic genres featured on his website, Johnston tells AP he feels he needs to have a wide variety of fine art prints to cater to different needs and tastes. While Johnston doesn’t describe himself as a “gearhead” he currently shoots with a Canon 1DX Mk II, 70-200mm f2.8L and 16-35mm f2.8L lenses. He’s also recently added a Canon 5D Mk IV and 24-70 f2.8L lens to his arsenal. While on Safari in East Africa with Canon I had the opportunity to use some long-range lenses; naturally I wanted to make the most of them by getting some really tight crops. Here a male lion gazes out onto the open plains of the Masai Mara in search of his next meal. Canon 1DX Mk II, 600mm f4 lens with 1.4x converter, 1/1250s @ f/7.1, ISO 640. Johnston says he likes to analyse the direction of light before determining the best possible composition. Perhaps much like his past as a skilled tradesman he first inspects “the job” and works out what needs to be done to achieve the end result. Johnston likes to spend as little time post processing as possible, preferring to get it right in camera. “Mostly my images only require small tweaks but occasionally I’ll take a more artistic approach,” he explains. He credits the internet as being a great source of information for learning techniques and handy tricks. He says he read a lot of articles and watched a number of tutorials when starting out. Joshua Nights: Being out in Joshua Tree National Park at night, all alone, in pitch black darkness and hearing strange sounds in the distance is enough to put anyone on the edge of their seat. It doesn’t help when you read a book in your hotel right before leaving that says puma’s have been known to frequent the area. This is a composite of two separate images, one exposing for the stars and the other for the tree which I illuminated with a speedlight. Canon EOS 5D Mk IV, 16-35mm f2.8 lens @ 16mm. 20s @ f/2.8, ISO 1250 for stars. 20s @ f/2.8, ISO 800 for tree. 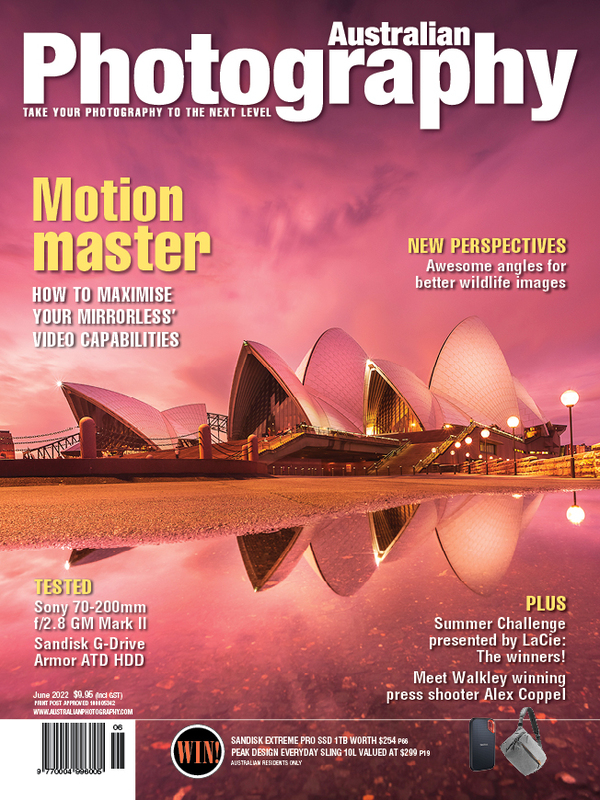 Johnston readily admits that professional photography is a difficult industry to break into. When asked about the differences and any similarities between being a plumber and a photographer, Johnston points out a factor any creative person would relish.